Imagine you are sick and live in the upper Manhattan section of New York City. Your doctor tells you that you need major surgery. Luckily, you have excellent insurance and can go anywhere in the city for that operation. Being an intelligent consumer, you decide to check HospitalSafetyScore.org, which is sponsored by the Leapfrog Group, a nationally known patient safety organization. You pull up a handy map of upper Manhattan and the lower Bronx to check the safety scores of hospitals in the area near your neighborhood. 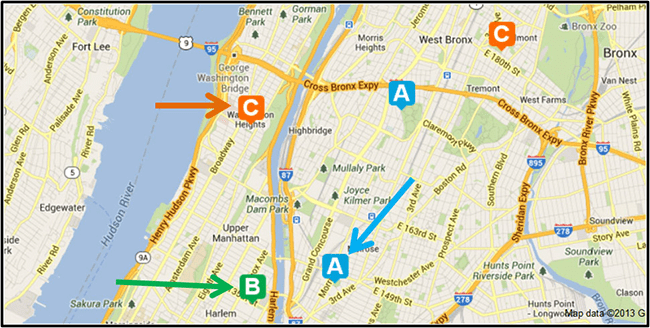 A hospital on the Manhattan side (orange arrow) has a safety score of only “C,” whereas another upper Manhattan hospital (green arrow) has a “B” rating, and over in the Bronx, there is an “A”-rated hospital (blue arrow). It’s a no-brainer, right? Clearly, the least safe of the three is the one with the “C” rating. But consider this. The “A”-rated hospital is Lincoln Medical and Mental Health Center, and the “B”-rated Hospital is Harlem Hospital Center. Both are teaching hospitals owned and run by the city of New York. But there is little research going on in either, and there are no regionally or nationally recognized experts in just about any specialty of medicine or surgery practicing there. The “C”-rated hospital is New York Presbyterian, the main teaching hospital of Columbia University’s medical school. A 2012 patient safety study by Consumer Reports listed the 30 worst hospitals for patient safety in the New York metropolitan area. Lincoln was the 16th worst, and Harlem was 23rd. Presbyterian did not make that list. Healthgrades rated New York Presbyterian as #5 of 203 hospitals in New York State, with 15 5-star ratings and 11 quality awards. Harlem was ranked #83, with three 5-star ratings, and Lincoln was #88, with three 5-Star ratings and 1 quality award. US News & World Report published a list of the 18 best hospitals in the country that made its “Honor Roll.” That list included New York Presbyterian at #7. Now which hospital would you choose? Skeptical Scalpel is a retired surgeon and was a surgical department chairman and residency program director for many years. He is board-certified in general surgery and a surgical sub-specialty and has re-certified in both several times. For the last three years, he has been blogging at SkepticalScalpel.blogspot.com and tweeting as @SkepticScalpel. His blog averages over 1400 page views per day, and he has over 8200 followers on Twitter.